Empty Hands Mission is to plant seeds of love and service in the heart of humanity in small ways. Well the heart of humanity is in our children - so getting a chance to spend beautiful time with our kiddos across all walks of life has been a blessing and amazing opportunity to share in the messages of kindness and gratitude. 2016 was a blessed journey for Empty Hands Music. Serving with souls and communities near and far, children from underprivileged backgrounds in our local slums through our work with Manav Sadhna to connecting heart to heart with love warriors in various communities: from U.S. to Europe, Africa to India. The world news may suggest otherwise, but I deeply believe and see that there is so much love and goodness being offered to the world by so many beings everyday. Thank you all for allowing me to engage in and be a small part of this everyday of my life. Thank you for your prayers, blessings and support to allow for this Empty Hands pilgrimage to continue to unfold in planting seeds of love and service in our own hearts and hopefully in the hearts of others. In the coming days we will begin our Empty Hands Pilgrimage 2017 through the U.S., Philippines, Israel and South Africa and then back to India. Love you all. Madison, WI - Hanging with the "Kindness Crew" at Lincoln Elementary School. Literally a group of amazing young souls that spend their recess time helping other kids. Ummm...Awesome! Thank you Lori Gustafson, you rock! The following words of Hafiz reverberated again and again during the few days of joining the Empty Hands Pilgrimage in Europe. It was a journey that connected hearts with noble friends to build community and nourishing great togetherness. Nicki Vellick has been creatively weaving positive messages and music into her yoga classes at the beautiful Yogalife Studio she owns in the centre of Graz, the second largest city in Austria. From the moment you walk into the studio, you can feel the presence of Nicki's compassionate and values-centred spirit, which exudes through attentive detail from majestic paintings of Ganesha and Buddha to miniature handpicked words of inspiration on postcards that adorn the walls. Her warm heart-centred spirit flows into the choices she makes in her life, such as in choosing to send her 4 year old son to a nursery which is a tippee tent in the centre of a forest where the only learning tools available to the toddlers are those offered by the gifts of nature. Or choosing quality organic ingredients to lovingly prepare meals for their two dogs, Mocca and Lunar. Nicki has been cultivating a growing community in Graz, teaching yoga infused with undertones of valuable wisdom. One regular student remarked, " I receive much more than a yoga class. When I attend Nicki's class, I feel like I've been to Church". Nicki has been using the song Grateful in a few of her Flow classes, and earlier this year, in September, gathered her yoga students in a Flow workshop in movement and rhythm with the song Being Kind in an intention to send all proceeds to the children in Syrian refugee camps in Austria. Collectively they raised more than 1100 Euros. The Empty Hands gathering that evening, was preceded by a 45 minute Flow Yoga class where about 22 students flowed gracefully in movement as Nimo sang the words to Grateful. It seemed that each asana (movement) was bowing in surrender to each lyric. It seemed that each lyric was honouring the life flowing through each movement. Movement externally, stillness within. Rhythm, movement, stillness, in union, in a oneness that was beyond beautiful to behold. In the last few minutes of Shavasana (resting) pose, eyes closed and palms clasped together and the words of Prayer flowed into our hearts. 30 minutes later, together with many helping hands, candles were lit, heart pins were pinned and warm hugs were offered to transform the space into an intimate circle with about 35 noble friends joining together to share inspiring stories and songs. Nicki opened the circle with a beautiful recital of the Sanskrit mantra Serva Bhavantu, a Peace prayer. With each song, each story shared, of an act of kindness, of love, of gratitude, hearts opened and overflowed. As one woman shared what she was grateful for, even before her voice started to tremble, Mocca strolled across the room to where the woman was, nestled close by her lap, a silent gesture of unconditional love and empathy ... A connection of hearts. On the bus ride to Vienna the next morning, I was filled with awe at the spectacular brush strokes the morning sun rays were painting across the canopy of sky above the Austrian countryside. Thoughts of exchanging hugs in a few hours with dear brother-in-service Jose, in Burgos, Spain, brought a smile to my heart. The car pulls into the drive just before midnight... (and just before Jose's birthday) Indeed with big smiles and even bigger hugs, Jose welcomes us so warmly into the family home, and within minutes the sounds of joyful "feliz cumpleaños" fill the night air. The village of Villasur and city of Burgos lie on the Camino Santiago, and there is a strong sense of community amongst the locals. 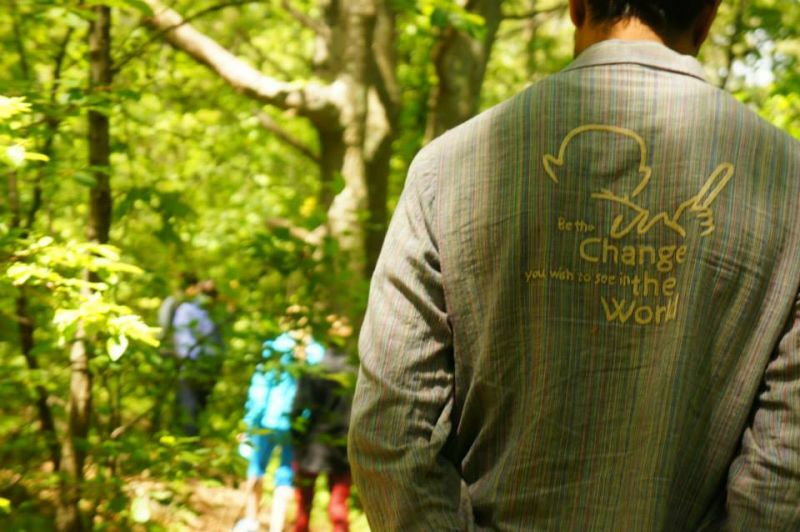 Jose's own pilgrimage of service over the years in Argentina, Ghana and India, has deeply inspired him over the past couple of years, to weave a stronger and deeper community spirit. By way of aligning his heart centred values with stillness and service, through hosting open house meditation circles at home, one day retreats and experiments in acts of kindness, the ripples have manifested into pay-it-forward yoga classes, smile cards in Spanish and much more. On the day of the gathering, the house is filled with a buzz of anticipation and alive-ness with folks from the community that Jose and his family have been nourishing togetherness with, come by to offer help in setting up for the evenings gathering of about 80 people. One friend, Laticia, came by with her art box to paint a pillar on the front verandah with beautiful leaves, where people were invited to write words from their heart. Alongside the verandah, a few women creatively adorned the lawn with a breathtaking mandala using twigs, golden autumnal leaves and petals. As people arrived, their arms laden with offerings for the meal that would be shared, they were welcomed with flower necklaces and heart pins. It was wonderful to see entire families join the evening, a diversity of ages, from 3 to 98 years. Tia Dominica, a 98 year old great aunt of Jose is a special soul. Her profound energy bursts forth from every pore in her elegant being. With every step she dances, with every word spoken, she sings. When I asked her (with the help of a translator) what it was that inspired her to stay so spirited with life, she replied " Love every person". So much love flowed that evening. There was nothing lost in translation as Jose articulated each story into Spanish. Every chorus had, word by word been translated onto the screen in Spanish, children, parents, grandparents and great grand aunt sung their hearts out. Many who came were friends or family, a few knew nobody, had happened to somehow hear of the event and felt a tug to come. At the close, they shared how it felt like they had known everybody and had arrived home. Something within had called out to Linda Vernon, to host an Empty Hands Music gathering in the coastal town of Blackpool, in the Lancashire region of North West England, where she has been living for about 12 years. Boasting a 7 mile pier front and big roller coasters, Blackpool used to be a holiday hotspot many decades ago These days, Blackpool is one of the most challenged and deprived areas in the region with high statistics of unemployment, depression and suicide rates. Linda in being the change, is aligning her head, hands and heart in intention to connect individuals with initiatives and community. It was a joy to experience her lively and deeply caring spirit, which shone brightly during the time spent with her and her two adorable daughters, Cianna and Maia. Especially heartwarming, was her insight on non-expectations of any situation, in that whatever unfolded, in the end, would be perfect. Having had only four weeks to plan for a gathering , this insight with a core of holding trust with deep intent, is paramount in staying positive. In the end, it was just perfect. It was a powerful and beautiful gathering set within the walls of St Pauls Church in the centre of the city. About 40 people gathered that afternoon, first in the lobby to listen to the NHS choir sing, moving on to the crypt to where the Empty Hands gathering took place. Especially endearing, was to see many children sitting on the floor, transfixed, as Nimo shared stories and songs and as Cianna confidently held the mic to sing Planting Seeds. One girl Grace, was prompted by her father to share a poem she had been inspired to write after repeatedly listening to Grateful in the car. It was wonderful to finally meet Kane, whom Linda had shared much about, and hear his insight on "listening" and his experiences of living life as a homeless person to living a life of deep purpose. As people mentioned, many seeds were planted that day, at the gathering and beyond. Linda has been moved and inspired to invite attendees at the gathering to partake in a 21 day Kindness Challenge that began on World Kindness Day. Furthermore, seeds of hosting monthly meditation gatherings at her home to hold space for others have been planted in her heart. All in an intention to connect hearts and build community. The three gatherings in London were the last of the Empty Hashes Tour in England, as well as the final three days for this year's 5 month tour. On one of these days, a few people set out in an intention to connect hearts with strangers in a Spontaneous Acts of Kindness Flashmob on one of the many bridges over the flowing river Thanes. "The first half was a medium thumbs-up because I was a little scared and nobody wanted the chocolate I was giving them, and the second half was a big thumbs up (imagine little girl with huge beaming smile and screaming this with enthusiasm!) :) because I wasn't scared anymore and started to smile and share hugs with people and they shared their smiles with me when they saw me smile at them. Mommy, the more you give the more you get right?" This year, once again, we were blessed with an opportunity to hold a gathering on behalf of all friends of Empty Hands Music in the beautiful Nave of St Ethelburga's Centre for Reconciliation and Peace. It was sacred to conclude the 5 month pilgrimage in a space devoted to bring ape ace and reconciliation in the world. It's an unknown space, in the middle of the capital's financial district, an oasis of peace, beauty and serenity. The beauty of a gathering which is hosted by no single individual or organisation, is in its ability to draw like-minded individuals from diverse communities and backgrounds, crystallising all into one togetherness of community. Volunteers wholeheartedly put their names forward, guests generously brought offerings of food and refreshments to share. Like all of Empty Hands offerings, this event was offered also as a gift. One young gentleman, clearly taken back by the beautiful space and warm welcoming with flower necklaces and hugs, asked if he was at the right event. Kiya, Eash and Rudra joined in singing Planting seeds. Chandra shared how she had found comfort listening to the words of Nimo’s songs through a severe period of illness and had been inspired to writethe song she was about to share. With each song, and each story that was shared, of kindness, of unconditional love, of non judgement, of oneness and community... people joined hands, held each other, sharing tears of joy and suffering. Opening and connecting hearts, in the knowing that ultimately we are interconnected and are the same. Together,we are planting seeds, nothing more. You can follow more events of Empty Hands on Facebook as well. Whether on the East Coast or West, the hospitable South or friendly Midwest—from suburban living rooms to inner-city schools, rustic sanctuaries to hotel convention halls— the people are beautifully distinct and stories strikingly similar. Seema stumbled across an Empty Hands Music video on someone’s Facebook link and dropped an email about hosting an event in her home during the Austin leg of the tour. Earlier in the year, Heather came across Being Kind, passed it to her dear friend Sandra who sent it to Joan who invited Nimo to share space the Marblehead Zen Center in Massachusetts. Nestled in an intimate Awakin Circle at Arathi and Joel’s apartment in DC, we meet Danny. On one of our last days in town, we serendipitously run into him on a park bench, and he tells us we have to do a gathering with his friend Cherie in Albuquerque, NM. One after another, online or offline, the sparks of resonance fire and light the way for our ever-evolving roadmap on this Empty Hands Music Pilgrimage. Last night's gathering is filled with small moments of beauty. Somehow, conditions have aligned for us to be around the corner from Martin Luther King Jr's childhood home, across the street from the church he grew up attending (and for which he became the pastor), and just beside a stunning bronze statue of Gandhi. Neelam lives in Brooklyn half the year, and has stayed down in Atlanta a little longer to see this event through. She and Nimo lay out rugs at the for of a stunning mural of MLK Jr. and the Civil Rights Movement. Chairs somehow spring up in a semi-circle behind them. As we slip posters and banners and the one-world flag across pillars and windows and cement surfaces, a spontaneous team of youth and adults make "Free Hug" signs and shower passerby with splashes of warmth through their smiling embraces. We enter the room with full, warm bellies from an abundant deep dish pizza dinner, complete with a couple thick heart-shaped pies! They were gifted from afar by a giant-hearted volunteer who simply wishes to "serve the servants", and we were all feeling the hearty love that emerges through the transmission of food. As the saying goes, "Food + Love = Prasad". It's Saturday evening of a weekend-long reunion retreat of 40 volunteers and friends of Manav Sadhna, a Gandhi Ashram-based non-profit dedicated to uplifting slum communities through love. After a full day of discussions, stories, and break-out sessions, we dissolve into an evening of Empty Hands with stories from various siblings of the service family, and songs from Nimo. As the clock strikes 9:30, students are lined up in the stairway and hall with a post-it in hand, with a description of an act of kindness they've done during the week. This is their entry "ticket"-- Nimo stands at the door, collecting and reading each post-it, high-fiving the students as they file into the gym. He later comments that over half of them are about helping mom or helping out around the house. One post-it even said, "I helped convince my friend not to commit suicide." With a couple hundred invisible and young "love warriors" like that in the audience, the assembly gets underway. Saying I ran 50 miles is fun and hasn’t gotten old yet. :) But the lessons I learned about myself are far more powerful than the actual race itself. My ego is powerful and hard to tame. People ask me what the hardest part was. 45? 49? No. 1-20 were absolutely the hardest. Reminding and convincing myself that I was ONLY doing this race for me and it didn’t matter that nearly everyone in the race passed me, was really hard. When I started running with 50-yr-old buddy who forced me to walk every 20 minutes, I remember wanting to ask her, “are you sure we need to walk right now?” I actually recognized the feeling inside of me of my ego creeping up when people would pass us. Taming it took a lot of strength but was really empowering. Our minds are so powerful. Sure, my training helped. But I didn't run as much as any training plan recommended. Making the conscious decision to approach the experience positively and I realizing that I was lucky as hell to even be taking on this challenge changed everything. I am deeply energized by giving energy to others. Naturally, I have a lot of energy. I was a cheerleader for 8 years. I can run on very little sleep. When I was teaching 7th and 9th graders, my classroom was like a fricken' fun house. It was a blast. I used to work as a “party motivator” and Teach For India Institute leader. I have a lot of energy! But the thing that makes me soar is giving energy to others. Learning more about myself is going to help me be better for others. Last Fall, Ellie travelled to India on a Fulbright to capture the stories of women in the state of Gujarat who had chosen to finish their educations, after having to leave it for extended periods of time. Through a friend of a friend, she stumbled into the Gandhi Ashram service family and effortlessly jumped in to film a bunch of labor-of-love projects, including our Grateful music video and Empty Hands Pilgrimage short. Walking around the US capital with her is like embracing the world through streams of stories. While on a 15-minute walk, we stumble and stop and say hello to at least 4 different friends/neighbors-turned-family. Her open-minded care, bouncing creativity, and faith in humanity makes everyone and everything around her full of possibility. A few months ago, Heather was searching for kindness on the internet and came across the "Being Kind" music video. She passed it along to her dear friend Sandra, who then sent it to Joan, who then emailed Nimo to visit the Marblehead Zen Center in Massachusetts. This past week, we had the beautiful opportunity to spend time with the blossoming community there, and the days have been filled with spontaneous and scheduled gatherings, little gestures of care, moments of grace, and shining smiles.